What does it take to convert a soon-to-retire engineering professor enamored of the chalkboard into someone who loves a technology tool? For Virginia Tech Alumni Distinguished Professor Charles Bostian, it took DyKnow Vision, a collaborative teaching tool that he is using in engineering classes as large as 180 students. Bostian, who works in the department of electrical and computer engineering and usually teaches just one class a semester because he is heavily involved in research, calls himself "an old guy and a blackboard-and-chalk teacher." He said he has disliked educational media in the past and hasn't been particularly interested in collaborative tools. "But this one has made a believer out of me," Bostian said. 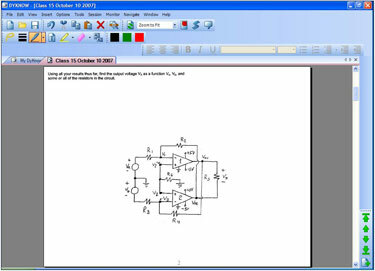 DyKnow is instructional software whose collaborative note-taking capabilities can deliver course materials to students on individual computer screens as the instructor teaches, allowing students to view and save the instructor's notes as they are made, and add their own notes as well. The product works with either traditional keyboard computers or tablets. Notes from students can be shared with the rest of the class, allowing collaborative groups. Students can save the files to their own computers, and also can access the class files later via Virginia Tech's Blackboard system. 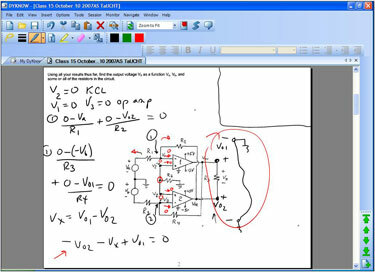 DyKnow's capabilities allow Bostian to display complex circuit diagrams to his large engineering classes on two large screens in class, using his tablet PC, then make notes right on the circuit diagrams. The course teaches circuit analysis--understanding the flow of power and information through a circuit, including voltage and currents. Bostian's notes from class are saved and uploaded for student review later. Students, also using wireless tablet computers, can view the diagrams and notes on the classroom screens or their tablets, where they can add their own notes, as well as viewing and saving Bostian's notes all at once, or at intervals if they choose. Using DyKnow's interactive capabilities, Bostian can also allow any student to write on the public screen. He's used that feature sparingly, however, since with 100-plus students in class, he's found it too confusing to allow all students to write at once. Instead, one student can be called on at once to participate from his or her seat, using the student's log-in ID. DyKnow also allows an audio recording of the lecture, but Bostian isn't using that feature; he said he prefers that students come to class and interact rather than simply accessing the lecture and notes later. Bostian is in his second semester of using DyKnow, first for a large sophomore circuits class that includes lots of analysis and mark-up of complex electronic circuit diagrams. Based on that success, he offered it this semester to a very different kind of course, a small graduate-level class in radiofrequency design that also includes lots of engineering diagrams. Shown DyKnow on the first day and offered a choice of whether to use it, the graduate students quickly elected to do so, using wireless university-issued tablet computers for the class. Virginia Tech's college of engineering recently began a new program requiring tablet PCs for all students, so, in the sophomore circuits class, Bostian uses those tablets. Beginning on the first day of class, he launched DyKnow and began working out any technical kinks with students, using several IT people to address student questions and problems for the 180-student class. IT staff continued to help out during class for several weeks. DyKnow saves him time by not having to draw out complicated diagrams while the class waits, Bostian said: "It gives me 10 minutes more because I'm not copying circuit diagrams onto the blackboard." But more to the point, DyKnow gives students a way to save the diagrams, along with their notes and his, at any intervals they choose. That can make it easier to review and understand the progression of logic in building a complex electronic circuit. Another interactive feature in the software that Bostian finds useful is the ability to conduct a quick poll of students to see who understands a concept. The resulting pie chart often simulates discussion, Bostian said, if students see that others are confused also. "They immediately started asking questions, because they're reassured that others don't understand either." He's also found that DyKnow allows him to roam the room as he teaches, monitoring students up and down the aisles. "DyKnow freed me from the blackboard because I wasn't spending time copying circuits onto the blackboard. I pop the circuit up and then I write [on it]. I can walk around the class and talk about what's there. It seems to be much easier than using the blackboard."